If the steering wheel is unlocked while the vehicle is in motion, it could change position unexpectedly. This could cause you to lose control of the vehicle. There is a risk of an accident. Before starting off, make sure the steering wheel is locked. Never unlock the steering wheel while the vehicle is in motion. ■ Push release lever 1 down completely. ■ Adjust the steering wheel to the desired position. ■ Push release lever 1 up completely. 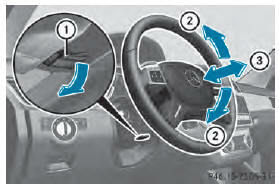 ■ Check if the steering column is locked.